Scientists sponsored by NASA and the Canadian Space Agency are exploring two remote B.C. lakes in the hope they might shed light on microbe-based life here on Earth and in outer space. A team of Canadian and American scientists is exploring two remote B.C. 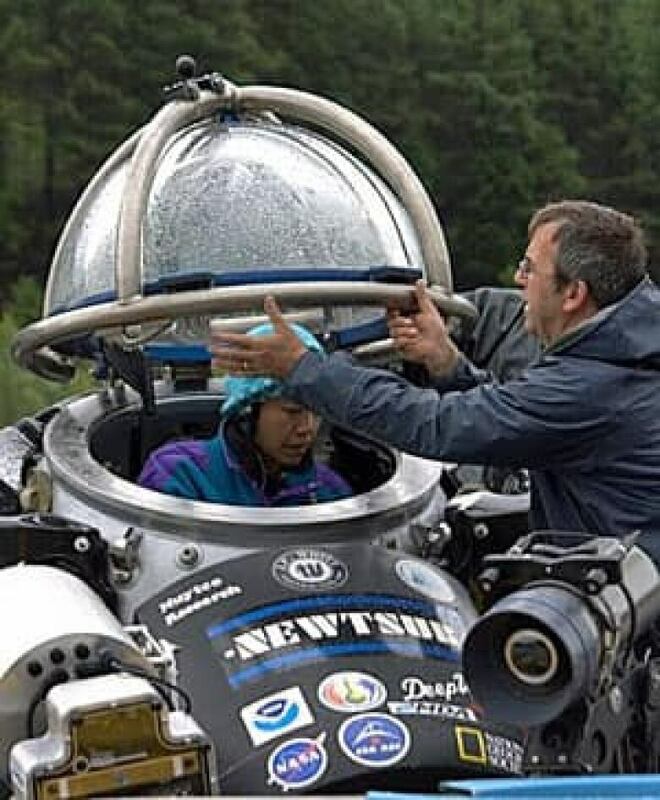 lakes, employing deepwater submersibles to study the living processes behind certain ancient rock structures. They hope these might shed light on the earliest forms of microbe-based life, both here on Earth and in outer space. Sponsored by both NASA and the Canadian Space Agency, the now seven-year-old Pavilion Lake Research Project expanded from its eponymous origins in July to nearby Kelly Lake, by the town of Clinton, B.C. The researchers are examining the origins of a specific and very ancient sedimentary formation formed by algae and a certain type of bacteria, in the process fine-turning exploratory techniques and clues that they feel might be useful on future space missions. "There are these rocks in the lake called microbialites that are built in some way by the bacteria living on the surface of the rock structure," explains principal investigator Darlene Lim, a limnologist, or lake scientist, at NASA's Ames Research Centre in California. Microbialites are carbonate rock structures that are believed to have been formed with the help of primitive micro-organisms such as bacteria. While they were common 2.5 billion to 540 million years ago, they are rarely found today in freshwater lakes, which made their discovery in Pavilion Lake in the 1990s of great interest to scientists. The Pavilion Lake microbialites are believed to be no more than about 10,000 years old. Scientists also believe that if life is found beyond Earth, it will likely be microbial and therefore the study of microbialite formations here could help identify signs of life elsewhere in the universe. In fact, a Martian meteorite discovered in Antarctica in 1984 was recently confirmed to contain crystals that look similar to some created by bacteria on Earth. "What we're trying to figure out is what the role of these microbes is in building up these rocks, both in a present-day sense and in a past sense." From about 2.5 billion years ago until about 500 million years ago, microbialites were very common, and they remain among the earliest remnants of life on the planet. As it happens, Pavilion Lake and Kelly Lake have an unusual amount and diversity of microbialites, in shapes ranging from artichoke-like to columns. By diving down to study the structures, whether in scuba gear or in a one-person submersible, researchers are hoping to uncover the chemical signatures that might be left by these microorganisms and to compare them with what they might find someday on distant asteroids and planets. To this end, the microbial ecologists and geochemists from the Pavilion Lake project have been working alongside astronauts, including NASA's Mike Gernhardt and Canada's Chris Hadfield, to study the unique ecosystems. For her part, Lim is a veteran of what NASA refers to as its space exploration "analogs," having spent time as well in a Mars simulation base in Canada's High Arctic, among other sites. The Pavilion Lake Research Project, though, is somewhat unique among these simulation programs in that it combines the study of exploratory technique with the collection of real data that a veritable village of researchers depends upon. She, in fact, was one of the scientists who piloted the DeepWorker subs below the surface this year and she can tell you that, while they are sisters, Kelly Lake is very different from Pavilion. "Pavilion is much bigger and much deeper, and the water clarity is much higher." Piloting through the much murkier green of Kelly Lake, on the other hand, made it difficult to make observations without moving in very close to the shore. "When we were at depths of about 120 feet of water, it was difficult to see even a foot in front of you," she says. "So you had to move very slowly. But it was extremely productive, and it was exhilarating when you came across something you weren't expecting." Both lakes are scientifically unusual, says Lim, because they're not extreme in any sense. Most places where microbialites are found today are either very salty or very alkaline. Indeed, they are among the most inhospitable places on the planet where few other organisms survive. As such, understanding the environmental conditions behind the growth of microbialites in these two lakes paints a better picture of early eras on Earth when these formations were much more common, Lim says. Both the space agencies supporting the project are also interested in any lessons they might learn about the logistics of future space missions. Despite being underwater, many of the technologies and research protocols surrounding this project are similar to what will be needed in other extreme environments, like space, says Lim. "All of these activities, whether they are with submersibles or scuba divers, have analogies to how we'll operate with humans on places like the moon, or Mars, or near-Earth objects in the future." For example, she says, "when we send humans to near-Earth objects or Mars, communications will be delayed between the time that you send them and the time that you receive them, because of the distance that it has to travel." At Pavilion Lake, they've discovered that allowing that lag between sub operators and teams talking to them on land seemed to allow some scientists to work better because they weren't being interrupted. She stresses, however, that the project was not examining more high-pressure emergency or technical situations. There is currently much uncertainty in the U.S. about space exploration, particularly now that the shuttle program has ended. But NASA is at least preparing the groundwork for manned missions further afield where the Pavilion Lake Research Project's work may come in handy. The Orion spacecraft, currently undergoing testing, is designed for deep space missions to Mars or nearby asteroids sometime around 2025 or 2030. "I think I'll be a little old by the time we get ourselves in gear to go to near-Earth objects, but my son and daughter will be perfect for it," Lim laughs. She said she had mixed emotions about the end of the shuttle program this summer, "a bit of nostalgia and melancholy, but also a whole lot of excitement looking forward. "We have no other option but to look to the future."